Caponi Financial is a leading edge insurance, benefits consulting, pension advisory and financial planning firm composing of credentialed employees committed to excellent client-service with an added personal touch. This family business was incorporated in Ontario and has served both individual and group clients in Canada and the U.S. for over 42 years. Using the principles of NEED – LIKE – AFFORD we tailor make solutions unique to each client's needs. The principal salespersons are Dennis Caponi, Sr., Dennis Caponi, Jr., Sheri Plowman, Thomas Caswell and Brian McDonough. That is, we provide insurance and financial services using a formula which first, through a fact finding process, finds out what the client's NEEDS are, second, what products are available and which one does the client LIKE and thirdly, tailor make a portfolio or products to match the client's pocketbook - AFFORD. Working closely with individuals and employers alike, CAPONI FINANCIAL designs custom-made solutions to complement your vision of financial and business success. 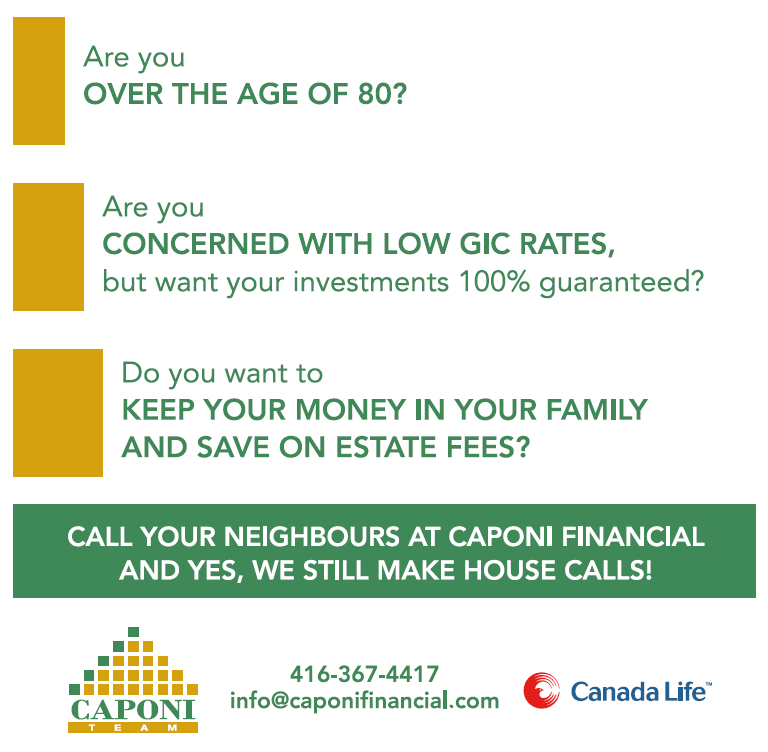 CAPONI FINANCIAL will actually meet with you in person in our local office, or in the comfort of your home. Your financial needs evolve and change as you reach certain landmarks in your lifetime such as getting married, or the children going to college or university. That is why it is important to build a strong relationship with a firm that takes the time to know you and comprehend your needs today and tomorrow. Dennis Jr. has been in the life insurance and investment business for twenty-five years. He has a Bachelor of Science Degree in Accounting from Xavier University in Cincinnati. Dennis holds his Certified Financial Planner designation and has successfully completed the Investment Funds Institute of Canada course. He is currently enrolled in the Canadian Life Underwriters course. Dennis Jr. He has been a Qualifying Member of the Million Dollar Round Table since 1998. Dennis recently completed his CEBs course to deepen his knowledge of Group Benefit policies and legislation. Specific to our Group Life and Health business, we have partnered with Anthony Feher A.S.A., B.Sc. Anthony comes to us with twenty-one years experience in the Group business. He is an Associate of the Society of Actuaries with a strong technical and marketing background. He has written and maintained the Health renewal systems for two large Canadian Insurers and has negotiated with consultants, insurers and clients specific to their group benefit needs, with case sizes ranging from 2 to 10,000 employees. It is the NEED to have the expertise to review your benefits and provide strong representation on your behalf that sets us apart. Prior to joining Caponi Financial, Tom was a senior executive at one of the largest independent mutual fund companies in Canada. He began his career in the financial services industry in 1991 with a small, private asset management company. He participated in the growth of that company to its current level of a large, publicly listed company on the TSX with $80 Billion in assets under management. Tom currently sits on the several industry board of directors. Tom adds extensive industry knowledge to Caponi Financial utilizing his twenty years experience in finance. Among his designations, Tom holds the Canadian life insurance license.